Fully 85 percent of your success in life is contained in your ability to communicate effectively with other people. Communicate with Confidence! is full of proven, practical ways to get your point across quickly and stand out in every conversation. This book should be read and re-read over and over again! Bestselling Author of How the Best Leaders Lead, Goals!, and Eat That Frog! Dianna Booher produced a tremendous resource with the first edition of this book—but I’m confident this new version will be a classic. Well-organized, practical, comprehensive advice. Communicate with Confidence! is . . . the clearest, most comprehen- -sive, and most credible guide to persuasive and authentic communication available today. Dianna Booher is the master of her message and her medium. . . . After you’ve read it once, I’m confident you’ll be consulting it frequently. Do not hesitate. Read it today, and put it to use immediately. 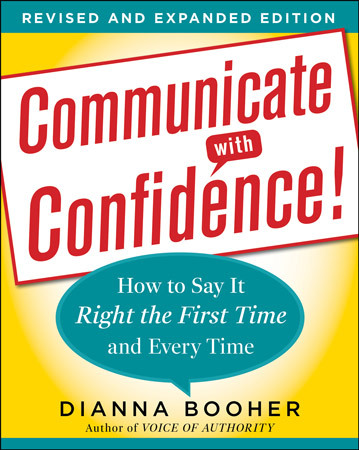 Communicate with Confidence! is the best communication book I have seen. Coauthor of The One Minute Manager® and Full Steam Ahead!